The myth of Turkmenistan’s economic buoyancy has been readily abetted over the years by international financial institutions. Even they are starting to revise their story, albeit slightly. The World Bank has lowered its forecast for economic growth to 5.6 percent this year and 5.1 percent in 2020. It was 6.2 percent in 2018. The Asian Development Bank forecast a slightly higher 6 and 5.8 percent for 2019 and 2020, respectively, but cautioned that inflation will outstrip growth. Since isolation has hardly helped, Ashgabat is trying for a change to play nice in one of the few diplomatic clubs it has agreed to join – the Commonwealth of Independent States, or CIS. Turkmenistan is an associate member of this group of post-Soviet successor states. Turkmenistan seems to be fulfilling its duties as this year’s CIS chair reasonably seriously, although it caused a minor stink by snubbing the handover ceremony in Tajikistan last September. Foreign Minister Rashid Meredov led a Turkmen delegation to the CIS annual meeting of foreign ministers on April 4-6 in Moscow. A heads of government summit will take place in Ashgabat on May 31, and the presidents are then to meet in the city on October 11. Meredov did some work on the sidelines of the Moscow confab, chatting with his colleague from Uzbekistan about prospects for greater cooperation and signing a cooperation roadmap for 2019-20 with Belarus. This latter detail is notable in view of the ugly ongoing spat with a Belarusian company over a potash plant that Turkmenistan says was not built to desired standards. Ashgabat is getting an important visitor from even further afield on April 16, when South Korean President Moon Jae-in kicks off a tour of Central Asia with a three-day visit. Turkmenistan is interested in tapping into all kinds of support from Korea, in heavy industry, textiles, agriculture and fisheries. Seoul, meanwhile, would like help getting a perch in Turkmenistan’s energy and construction sectors. Fingers will be crossed that this does not lead to yet more troubled joint ventures. A Japanese-built gas-to-gasoline plant that was supposed to open last year has been delayed until this summer at the earliest, the Chronicles of Turkmenistan reported this week. Some of the bridge-building is more literal. Deputy Prime Minister Dadebai Amangeldiyev told the Cabinet on April 5 that preparations are ongoing to construct a 225-kilometer highway running from the Caspian port city of Turkmenbashi to Kazakhstan. The road that runs along the Garabogazkol isthmus joining the westernmost regions of the two nations is currently a mule track that turns into impassable mush after rain. Amangeldiyev said the new road will be 22.5 meters wide, enough to accommodate four highway-sized lanes and a median. In other connectivity news, Uzbekistan has reportedly hitched itself to the so-called China-Kazakhstan-Turkmenistan-Iran railway corridor. The expansion of this transportation link will go some way toward enhancing its relevance, which has begun to feel doubtful in light of the disappointing volumes of goods moved since Kazakhstan, Turkmenistan and Iran inaugurated their section of the track in December 2014. Tajikistan, meanwhile, is being left out in the cold by Turkmenistan. There have been fresh reports that the Turkmens are barring Tajik freight trucks from crossing their territory. One line of speculation doing the rounds is that this is a reprisal for Dushanbe dragging its feet on the project to build a Turkmenistan-Afghanistan-Tajikistan railroad. If rights activists prove successful, it will be Turkmenistan that faces embargoes in future. 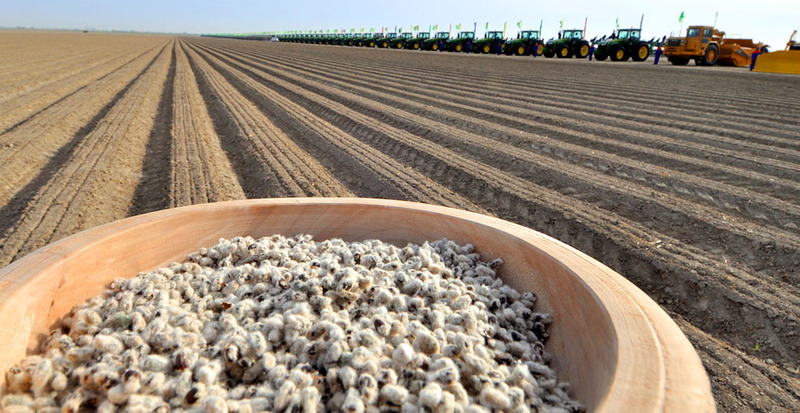 A report published on April 5 by London-based Anti-Slavery International dwells on the role of Turkish middlemen in getting Turkmen cotton onto the international market. This is a problem because, as Anti-Slavery International notes, “Turkmenistan’s cotton production has the characteristics of a forced-labor system.” Shoppers across the world may little know that the shirts on their backs are made with material picked by modern-day slaves, many of them children. “Cotton picking is arduous work and conditions in the fields are poor, with limited access to fresh drinking water. Turkmen citizens are sometimes forced to leave their homes and spend weeks in the cotton fields. Workers assigned to remote areas have to stay overnight, often crowded into temporary accommodation, and with no option but to live in unsanitary conditions,” the watchdog noted in its report. One firm, Calik Holding, and multiple related entities are reportedly responsible for much of this trade. 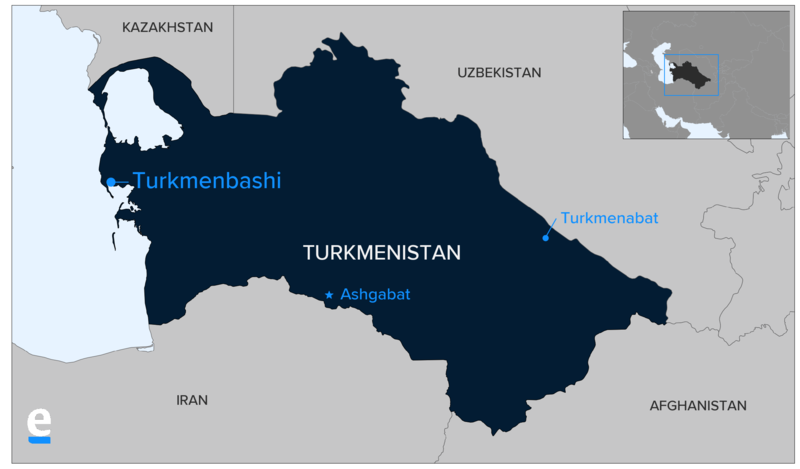 The company and its chairman, Ahmet Calik, are longtime movers and shakers in Turkmenistan, with their interests stretching well beyond the textile sector into other major projects, including the construction of the Garabogaz ammonia and urea fertilizer plant. Anti-Slavery International also names and shames Singapore-based commodity firm Olam International and Switzerland's Paul Reinhart AG and Rezana Trading SA. The floods keep coming. On April 4, RFE/RL’s Turkmen service, Radio Azatlyk, reported that up to 700 houses in the Tagtabazar district had been destroyed. Many videoclips showing scenes of waterlogged fields were uploaded to the internet despite the government’s best efforts to prevent such citizen journalism. The flooding has caused heavy damage to roads, contributing to a spate of car accidents. One such accident took the life of Azatlyk's own longtime correspondent, Amanmurad Bugayev, in Balkan province on April 3. His death was mourned by exile media outlets. State and government-linked media outlets do not comment on such events. When they do comment on independent media, it is almost always to smear them. The only allusion to the country's difficulties in state media was the announcement of another severe reprimand from the president for Interior Minister Isgender Mulikov. According to the Chronicles of Turkmenistan, this was not a result of the bungled response to flooding or other such problems, but because the president is displeased that private taxis are still operating without proper licensing. Not too surprisingly, the app that has resulted from the government’s attempt to push through an Uber-type system is riddled with bugs.